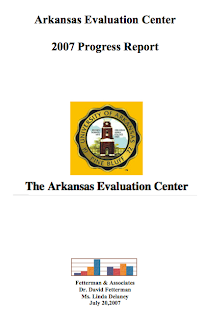 The Arkansas Evaluation Center 2007 Progress Report. The report provides a portrait of our efforts to-date, in broad strokes. The report summarizes steps taken to date working with the legislature, developing curriculum, and identifying funding opportunities. The next steps will focus on additional curricular design issues, the development of individual workshop-specific modules, marketing, and securing funding. For a copy of the report please click here.